Remember that time when your client had an on-the-spot question you couldn’t answer right away? Or when you wanted to do some spot-checking and you didn’t have the time to set up a complete drainage system? 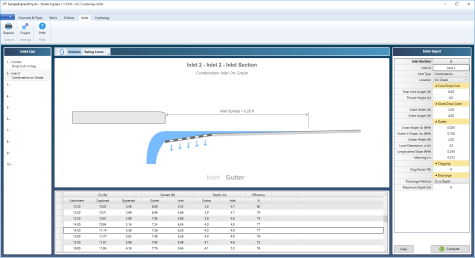 What you really wanted was a simple hydraulic calculator tool to do quick pipe, open channel, orifice, weir, inlet and other hydrology calculations, on the fly. Enter Studio Express. An all-new hydraulics and hydrology software that saves time and makes you look sharp when time is not an option. It’s the perfect companion to Hydrology Studio and Stormwater Studio. 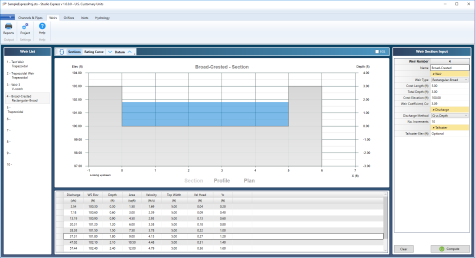 Like all Hydrology Studio products, it was designed to be as easy to use as it is beautiful to look at, but also fast. It makes you more productive with your time, instead of wasting your time with endless and confusing dialog boxes. Select a channel, weir, orifice or pipe shape, inlet type or hydrograph method with your mouse. Enter a few data items and you’re done. Use it once and you’ll be hooked. Hands down, it will be the Studio Express icon you’ll be clicking on first. It’ll be your hydraulics and hydrology tool of choice on every project because it’s dead simple to use. And plenty of answers you’ll get. A whole range of them in fact. Any of which you can turn into the industry’s finest graphics with a single mouse click. 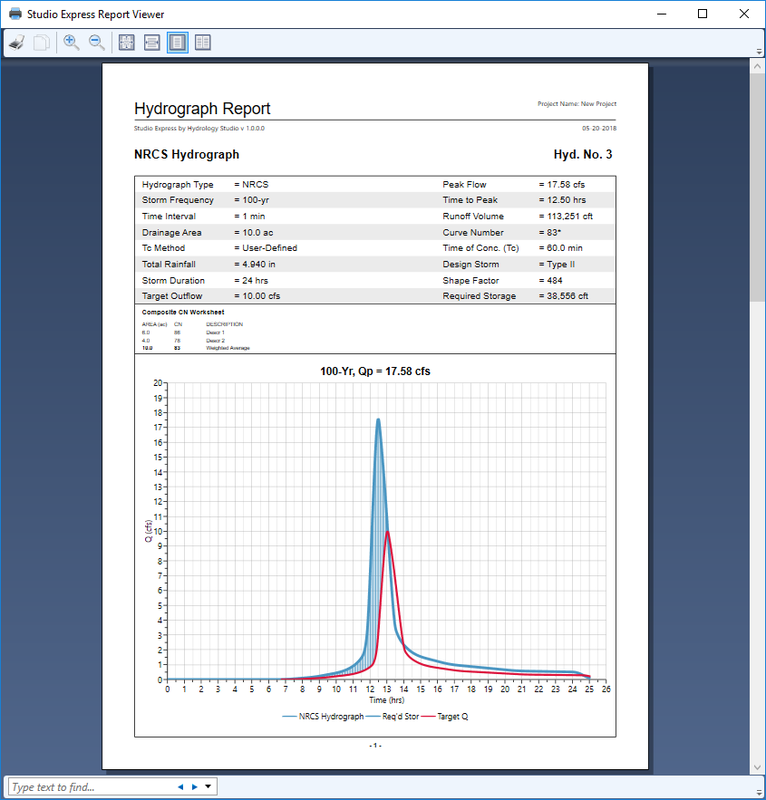 Another mouse click produces a professional looking hydraulics report for your files. 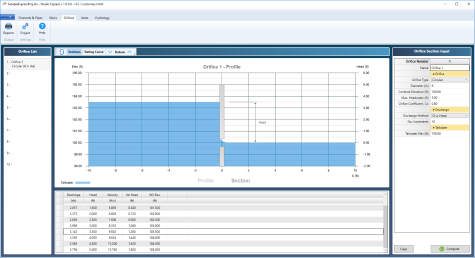 Output tables can be exported to spreadsheet files for further processing. 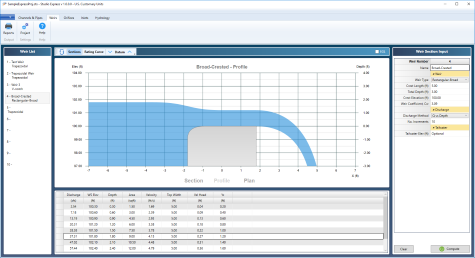 Analyze and design a variety of open channels for normal depth. User-defined parameters include total depth, bottom widths, side-slopes and bed slope. Input user-defined open channel shapes with up to 50 station & elevation points including varying n-values across the entire section. 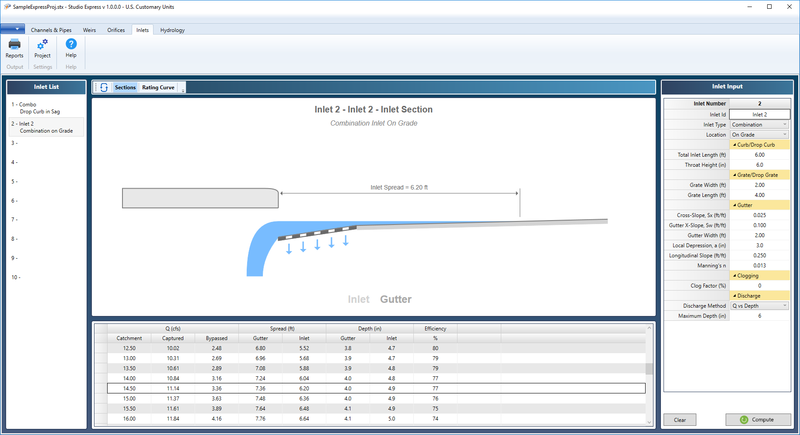 Forget studying some rating curve to get a pipe size or a channel width. 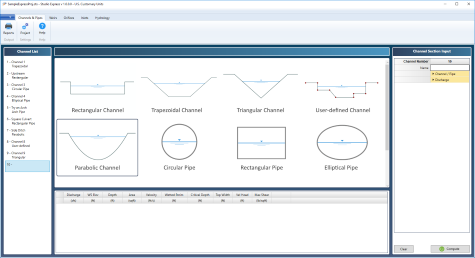 Studio Express offers an option to design open channels as well as pipe sizes when inputting a known design flow rate. 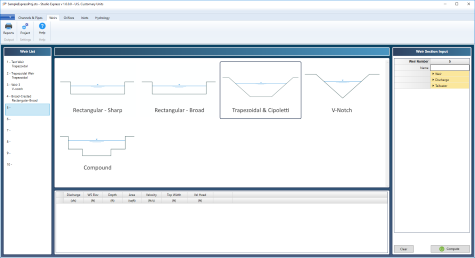 Weirs can be calculated for any range of flow rates. 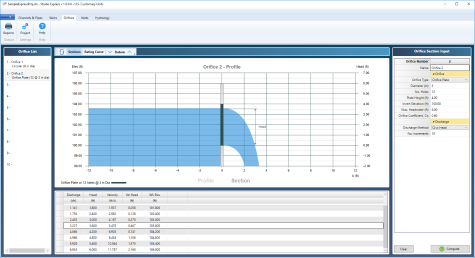 Options include a user-defined tailwater for weir submergence calculations and an adjustable Datum. Projectile motion concepts are employed for determining the distance the weir’s free-flow travels. Designed to be analyzed with minimal inputs. Options include a user-defined tailwater for submerged orifice calculations and an adjustable Datum. Projectile motion concepts are applied for determining the distance the orifice free-flow jet travels. 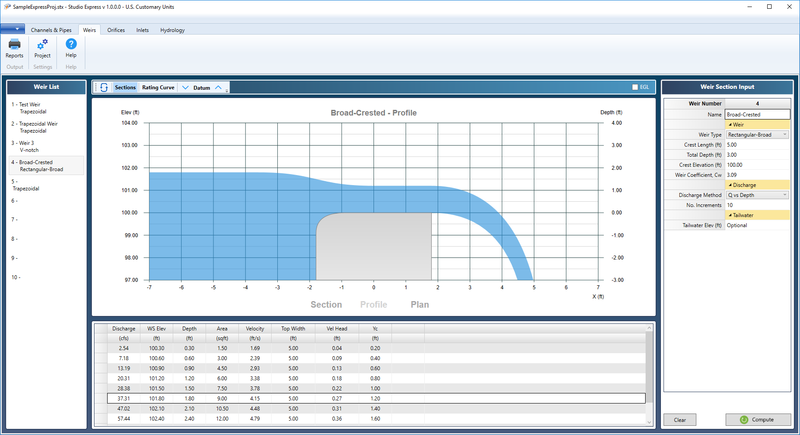 Following the methodology of FHWA HEC-22 inlets, Studio Express calculates interception capacity, bypass and spreads at both the face of the inlet and just upstream of the inlet (gutter). Inlet flows can be specified as a range, single Q or user-defined set. Inlets can be located in a sag or on a longitudinal slope and can be of any size with user-definable gutter and pavement cross-slopes and clogging factors. 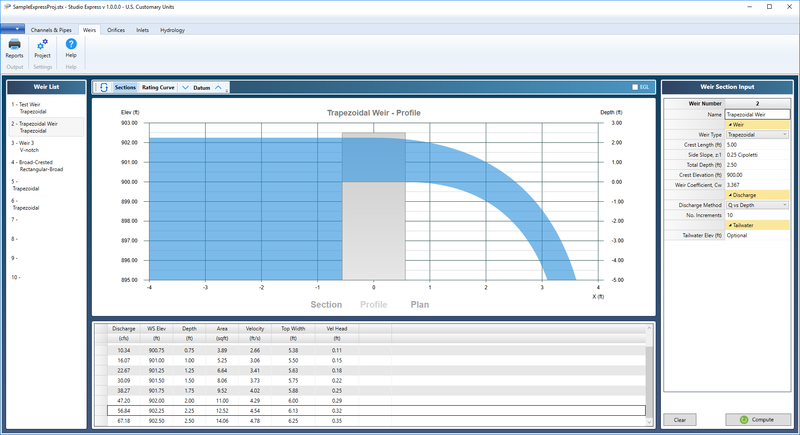 You’ll get built-in calculators for developing composite runoff coefficients and NRCS Curve Numbers. Its built-in Tc calculator computes NRCS Lag, multi-segment TR-55 and Kirpich Tc. 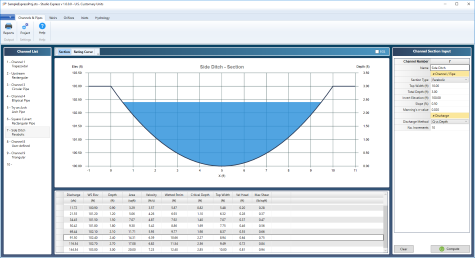 NRCS hydrographs include a user-definable Shape Factor. 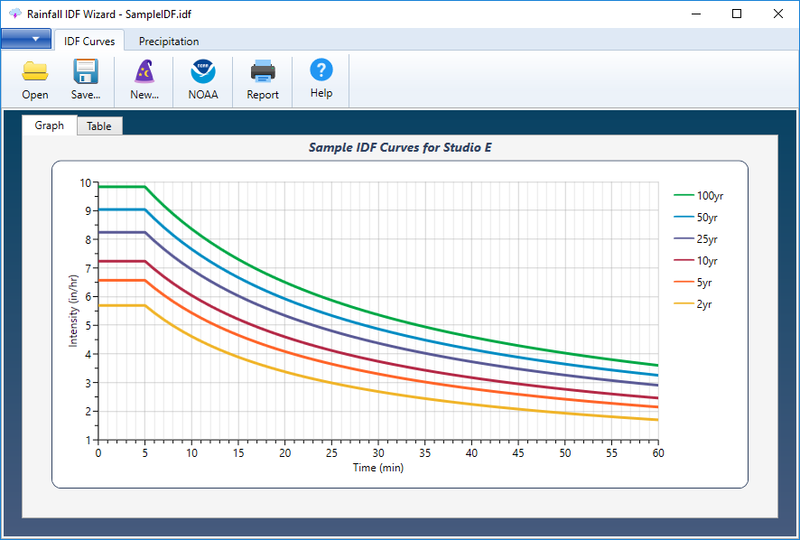 Studio Express constructs each runoff hydrograph in one-minute time intervals for up to 48-hours. Critical for small drainage areas with BMP or LID requirements to insure proper coverage. 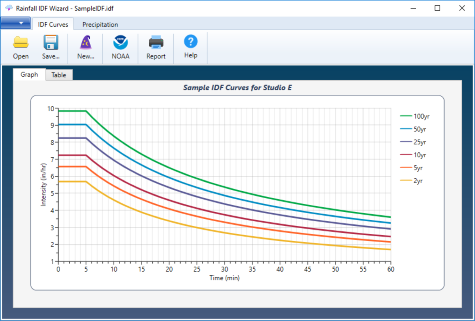 IDF curves can be automatically created from NOAA Atlas 2, 14 or existing rainfall data using the built-in IDF Wizard. Import directly from NOAA. Need a quick size estimate for a proposed detention pond? 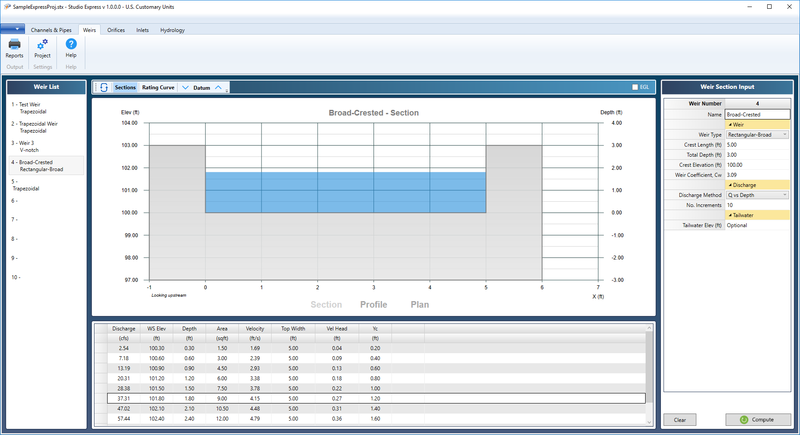 Simply enter your target release rate and Studio Express will calculate the total required storage for you. A printed formal report is available which includes inputs, graph, numerical table and supporting worksheets. Experience a modern-day user interface with your hydraulics and hydrology software. Built from the ground up using Microsoft’s dot-net WPF (Windows Presentation Foundation) it provides a rich and clean presentation while taking advantage of today’s modern hardware. Built on top of Microsoft’s DirectX, WPF makes graphics rendering lightning fast while using device-independent pixels. 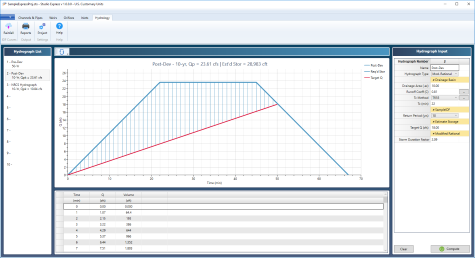 Everything is automatically scaled up or down as the target PC changes. 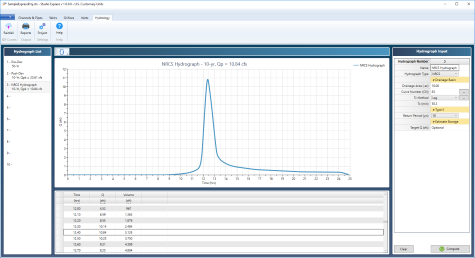 Learn more about WPF here. Studio Express is a stand-alone software product. Any off-the-shelf PC running Microsoft Windows 7, 8 or 10 and beyond will run Studio Express. An internet connection is recommended for automatic updates and online help. No additional software is required. Studio Express employs Microsoft’s “Click-Once” technology for easy, no-hassel installations. No zip files to open or messy procedures to follow. Just click the Download button and within seconds your new hydraulics calculator software is up and running. Program updates occur with a single mouse click. Download your free trial here. Get the hydrology calculator software you need when time is not an option. Buy it stand alone or bundled with the Suite.